Alas for the breath of autumn! "magnificent threnody to dying nature.... We encounter, perhaps for the first time (in Chinese poetry), a fully developed sense of ... the pathos of natural objects, which was to be the theme of so much Chinese poetry throughout the ages." As the original afterword to the qin melody of 1525 makes clear, it follows the same ideas as the Chu Ci poem. The music detailed in Xilutang Qintong is notable for the way it repeats and develops several distintive phrases ending on the relative note re, but then usually reverts to la at the end of each section (though the whole melody ends on re). The modal characteristics are mentioned further below. Song Yu of Chu had talent but lost his will; he was not in tune with his times. When he felt the autumn air he sighed in mourning. Later people accordingly applied this to the qin. 7230.63 has only 宋玉 Song Yu, with details about him. 11088.35 悲秋 bei qiu refers to 九辯 Jiu Bian then two later poems, by 杜甫 Du Fu and 劉兼 Liu Jian. As for 悲 bei by itself, it might also be translated as "gets emotional about" - for this understanding of 悲 bei see also under Mozi Bei Ge as well as an article by Ronald Egan showing that bei can refer not just to the common meaning of sadness, but to the emotion one is feeling when something is so beautiful it brings tears to the eyes. For qiliang tuning, from standard tuning raise the 2nd and 5th strings. As discussed under Shenpin Qiliang Yi and Modality in early Ming qin tablature, the main tonal center in this mode is usually re, secondarily la. Here the main tonal center through most of the sections is re, but the sections usually end on la. The last section ends even more strongly on la, but then the harmonic coda is centered on re from beginning to end. Zha Guide 22/196/-- lists it in seven handbooks, but the latter six are unrelated melodies using standard tuning; the present melody can be found only here in 1525. None of these tablatures has any commentary other than the brief attributions mentioned here. This poem from Chu Ci is translated as Nine Changes by David Hawkes (see Songs of the South, pp.207-219). Hawkes says Nine Arguments or Nine Disputes might seem a better translation; he chose Nine Changes as a title "borrowed from legend; and in the legend Jiu Bian has the sense of musical changes or 'modes'." Another translation is Nine Apologies (see Xu Yuanzhong, Poetry of the South; Changsha, Hunan Publishing Co., 1992). 2The original did not have sections indicated. Hawkes divides it into eleven, "following mainly the rhymes, the sense and my own intuition". Other editions may break it into nine or ten sections. 悲哉秋之為氣也！ Alas for the breath of autumn! 寂寥兮收潦而水清， Still and deep: the streams have drunk full and the waters are clear. Hawkes' translation sets out the poem in 257 lines. The original is not divided into sections but Hawkes divides it into 11 "following mainly the rhymes, the sense nd my own intuition". The complete text is easily found online. 6. For another qin setting of an autumn lament see Qiusheng Fu. Not yet online, but see the Bai Yunli illustrations as well as the footnote below. The poem/line reference numbers used here are based on the Penguin translation Songs of the South by David Hawkes, which divided it into 11 sections. 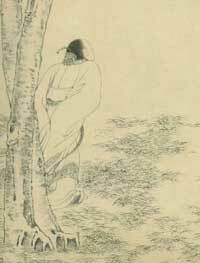 The illustrations by 白雲立 Bai Yunli are based on a set of nine by the scholar artist 門應兆 Men Yingzhao (active during 1736-1795). Men's illustrations were originally published in 欽定補繪蕭雲從離騷全圖 Qinding Bu hui Xiao Yuncong Li Sao Quantu, The Imperially Ordered Complete Illustrations of Li Sao Supplementing the Sketches by Xiao Yuncong. See details under Chu Ci.